Everything you need to know for your Super Bowl Experience! We are thrilled to have you take part in Super Bowl LIII in Atlanta. This trip will be an amazing life experience! We have collated the below information to assist you in your travels. As always, we are available for any questions you have at info@insiderexperience.com. Karine & Jason and the Insider Sports team. Please put these numbers in your phone. You can text or call us at any time! INTERNET. Internet access is offered complimentary at the hotel for all in-house guests. BREAKFAST. The Hotel offers a “grab n go” breakfast and they also have indicated they may offer a hot breakfast over Super Bowl Weekend. More details will follow. Breakfast is an additional cost. FITNESS. The hotel fitness center “re:charge” is open 24 hours a day. There is also a heated outdoor pool, which is open from 6am to 10pm daily. Temperatures in February may not be conducive to an outdoor swim this time of year! ON SITE BAR. There is a hotel bar onsite called WXYZ and operates seven days per week. The bar also serves a choice of light bites. GRAB-N-GO. There is a convenient grab-n-go food outlet called Re:Fuel located in the lobby and can provide you with easy grab & go meals, mix-and-match munchies, healthy bites, or make-your-own cappuccinos and more. As part of your package with us, your nightly room rate and all taxes are included. When you check-in you will be asked to put a credit card on the room to cover all other incidentals. PARKING - please note you need to pre-book parking at this hotel, please email us if you need to book parking. INTERNET. Internet access is offered complimentary at the hotel if you are or become a Hilton Honors member. We suggest signing up to this before you leave and ensuring you have your member number with you in Atlanta. BREAKFAST. Offered each morning in the hotel restaurant or via room service. Not included in your room rate. FITNESS. The hotel fitness center is open 24 hours a day, and is one of the most extensive in the downtown area featuring basketball, jogging track, tennis court and fitness room. ON SITE BAR / RESTAURANT. There are three lounges located in the hotel along with four restaurant options, each will be open late during Super Bowl week. For detailed hours of operation, check back with us closer to the event or on site with the front desk staff. OTHER SERVICES. There is a FedEx Shipping centre located in house, as well as a Concierge Desk, and Room Service offered from 6am to 11:30pm daily. We suggest packing a jumper or two! On average in Atlanta, early Feb has an average high of 12°C during the days and lows of 2°C at night, so it's best to be prepared. Due to the volume of people arriving into Atlanta over Super Bowl week, getting into and out of the Airport may be a lengthy process. For those flying out on Monday 4th Feb, it is suggested you arrive at the airport three hours prior to your scheduled departure time to clear check-in and clear security lines. Please also allow lots of time for travel as there will be a LOT of traffic. For airport transfers each-way, TAXI's or UBER are the most cost effective mode of transport. Please ensure you have the UBER app loaded on your phone prior to departure to the States. If you would like a private transfer with a car and driver to meet you at the airport, please email us. And we are sure you all have this covered, but don't forget to check your ESTA Visa is in place prior to departing Australia! Click here for more information on local transportation options. You will be able to collect your Super Bowl ticket and tailgate party ticket from our team on Friday, 1st February or Sat 2nd Feb.
We have sent out the link for you to schedule a time with us. For security reasons, we will not be publicly sharing this link, nor the time and location of our ticket collection point. If you have not received this email please let us know. You will notice when you pick up your tickets in Atlanta from us, that there is a face value price printed on each ticket. As there is no way for the general public to buy tickets direct for this game from the NFL, this can cause some confusion with our guests. So, we thought it may make sense to try to give some insight here. There are a very limited number of NFL club members, and players for NFL franchises that are offered to pay this price for their ticket. The rest of us, including the NFL’s commercial arm of On Location Experiences and their Agents, have to pay the Retail Rate, which includes the VIP Pregame Hospitality package. Please reach out to us if you have any questions on how the pricing, secondary market or the retail value of your ticket is calculated. We are happy to clarify for you if you have questions. Lucky for you, by booking with Insider Sports you will have no transport issues on game day!! Both of our host hotels are just a 10-15 minute casual stroll to the Pregame Tailgate Party for all of our guests! IMPORTANT - MERCEDES BENZ STADIUM HAVE ADVISED US THEY WILL NOT ACCEPT AN INTERNATIONAL DRIVERS LISCENCE AS A FORM OF ID FOR ALCOHOL SALES. YOU WILL NEED TO CARRY YOUR PASSPORT. Super Bowl LIII - Fan Mobile Pass app is your exclusive access to all the exciting NFL Super Bowl LIII events taking place in Atlanta, GA. Download the app prior to attending any NFL Super Bowl LIII event or sign up onsite. This year's NFL-produced tailgate party takes place in the Georgia World Congress Center, Atlanta’s multi-purpose Convention Centre, located across the road from Mercedes-Benz Stadium. There will be multiple parties running on Game Day, and the “53 Live” Tailgate will be held in Building A (Hall A - Level 1). There will be plenty of top-shelf spirits, beer, soft drinks and food on offer. The Party runs from 2:30pm - 5:30pm local time, which provides enough time to make your way to your seats to take in all the pre-game festivities. UPDATE: Musical acts DJ Ruckus and The Jacks have been announced as the headline acts for the 53 Live Pregame Tailgate Party. Both have Australian ties, with DJ Ruckus being married to an Australian model, and The Jacks having started out in Melbourne. Chef Joseph Flamm Winner of Bravo’s Top Chef Season 15, will be curating our pregame party menus at Super Bowl 53. Chef Joe is doing it the Georgia way and putting together a Southern Style menu that will give guests a true taste of Atlanta. He attended Le Cordon Bleu College of Culinary Arts where he mastered his cooking skills across all cuisines. His incredible culinary abilities have led him to cook for presidents, celebrities, and now Super Bowl. Currently, Chef Joe is the Executive Chef at Michelin-starred Spiaggia & Café Spiaggia. This tailgate party is INCLUDED in your ticket. For those who would prefer to take in all the sights and sounds of the pregame warmups, the NFL introduced a new initiative this year where the host of ESPN’s Red Zone, Scott Hanson, provides a 90-minute pregame rundown of the team’s players on field during the warmups, with exclusive interviews and predictions of the game to come. If this is of interest to you, we recommend you make you way to your seats by 5pm local time to take in all the atmosphere inside Mercedes-Benz Stadium. Gladys Knight will sing the National Anthem during Super Bowl LIII. The seven-time Grammy-winner’s performance will take place during the pre-game festivities and be televised live on CBS before the game’s kickoff. The NFL Clear Bag Policy has been in place for many years, and ALL fans must adhere to the list of prohibited items, and how to carry items into Mercedes-Benz Stadium in a clear bag. Please CLICK HERE for the latest information for game day. Bags and purses must be smaller than 4.5" x 6.5" in size. Please note when you pick-up your tickets we will be providing a clear bag that meets the NFL specifications. One is provided for every two tickets. All guests purchasing alcohol, who appear to be younger than 30 years old, must present a valid ID. An international drivers licence will not be accepted. No alcohol will be sold to guests who appear to be impaired. There is a two (2) alcohol drink limit, per transaction. Alcohol sales on the concourses and in the seating areas will generally terminate at the end of the third quarter. On Location Experiences is hosting the first ever Bud Light Music Festival in Atlanta for Super Bowl 2019. The official hospitality partner of the NFL, this three-night festival will give football fans and the entire city of Atlanta an opportunity to enjoy the artists they love from Thursday, January 31 through Saturday, February 2 at Atlanta’s fully transformed, premium, sports and live entertainment venue, State Farm Arena (home of the NBA’s Atlanta Hawks franchise). These shows have no age restriction; remember in USA you must be 21 years of age to consume alcohol. On Saturday night, Bruno Mars will headline with Cardi B opening. On Thursday night, Atlanta hip-hop legend Ludacris & Friends, Quality Control Presents: Migos, Lil Yachty, & Lil Baby. Plus, Metro Boomin + Special Guests, a DJ set by Lil Jon, & more. Contact Insider Sports if you are interested in VIP access to any of these concerts. Prices start from USD$800 per person and price depends on which concert. Legendary rock band Foo Fighters will perform at this year’s DIRECTV Super Saturday Night on Feb. 2 in Atlanta, the evening before the Big Game. DIRECTV has celebrated the weekend of the Big Game for 13 years with one-of-a-kind fan experiences and performances. This year, an intimate custom-built, 3-tiered, 72,000 square-foot venue will be constructed at Atlantic Station. If you would like VIP tickets which include a VIP entrance, dedicated area and full open bar, please contact our team. These tickets are from USD$1200 per person. This event will be held the Saturday Night at the Fairmont. “Future” is the headline act along with Jamie Fox and Diplo. VIP tickets priced at USD$850.00 per person, including full open bar. Upgrades available for shared table for USD$1350 per person. Doors open at 9pm and the party goes until 2am. Approx 1500 guests expected at this event. This event has just been announced for the Saturday night. The Sports Illustrated Experience: Atlanta, will be held at The College Football Hall of Fame, an incredible 95,000 square feet venue with a 45-yard indoor football field and more than 50 engaging and interactive exhibits. Talent has been announced as Snoop Dogg, Lil Wayne, and Dj IRIE. All tickets include full open bar. General admission tickets are USD$500 per person, and VIP tickets are USD$1000 per person (VIP tickets include VIP admission, access to VIP Field, VIP Bathrooms, fast entrance lane). Doors open at 9pm and the party goes until 2am. Approx 2000 - 2500 people expected at this event. This event is being held on the Saturday night. The event is being held at The Goat Farm and Ludacris is headlining with Little Keed also performing. Timing TBA. General Admission tickets are USD$785 per person and VIP is USD$1050 per person. Both tickets include full open bar and VIP includes a designated area with lounge furniture and private bar. Approx 1400 guests expected at this event. This event will be held on the Friday night from 10pm - 2am. Join Capital Records & Migos in a private celebration of their newest album. The room will be filled with artists, celebs, and the Migos closest friends. This is not available to the public and all guests must be approved. Tickets are USD$1750 per person. This event will be held on the Friday night from 10pm - 2am. Gary Vaynerchuck’s VaynerMedia hosts its first annual Super Bowl Bash in Atlanta. Expect a crowd of the top athletes in town, as well as many celebrity appearances and guest performances. Tickets are from USD$950 per person. Special guest artist is G-Eazy. Population: Atlanta is the capital of, and the most populous city in the state of Georgia. It is the 9th largest metropolitan area in the US (in comparison last year’s host city Minneapolis was the 39th largest). Time Zone: UTC– 5 Hours. Eastern Standard Time (EST) in the USA. During the month of February, Sydney & Melbourne are 16 hours ahead of Atlanta; meaning that when it’s 10am in Sydney / Melbourne, it’s 6pm in Atlanta the day prior. Electricity: The standard US voltage is 100 volts (compared to Australia’s 240 volts). If you are taking any electrical appliances make sure you get an adapter or two before you leave (you most likely won’t find an Aussie power adapter in the US). Light switches in the US are the opposite (up for on, down for off). Insider Tip: If you have a lot of devices that need to be charged overnight like we do, bring a 4-outlet power strip with you from Australia that way you only need one US converter to plug in and charge all your devices overnight! Remember: When crossing a road, look left first, then right. It takes a bit of getting used to, but it is something you need to be aware of all the time and it’s easy to forget. We highly recommend you venture in and around the Downtown Atlanta during the days and take in the atmosphere and American culture that surrounds this amazing, once-in-a-lifetime event. Super Bowl Live. Taking place outside at Centennial Olympic Park located just metres from the Aloft Hotel in Downtown Atlanta, this is a free event for all ages to experience the Super Bowl flare, and includes a fan festival with concerts and other activities. Click this link to check out the entire schedule of events, and updated concert schedule. From the desk of Brett Daniels, COO of the Atlanta Super Bowl Host Committee, comes Inside The Huddle. 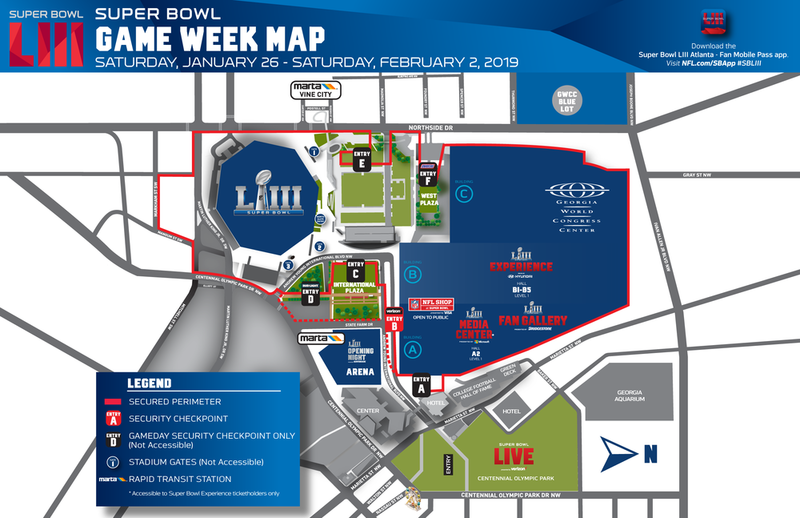 Your guide to know everything before you go to Super Bowl LIII in Atlanta. Whilst the hotel will have US style coffee, for something a little more like home, there are two places within walking distance. Caribou Coffee and Corner Bakery Cafe. The hotel staff will be able to give you directions. Downtown Atlanta Map - including Super Bowl Live, Super Bowl NFL Experience, Georgia World Congress Center, and Mercedes-Benz Stadium.